Oh gosh, Branden’s aunt gave him one of the most incredible cookbooks for Christmas, called Plenty. If you’re a vegetarian, this book is a must to liven up your life. Even if you’re not a vegetarian but appreciate vegetables, you should probably consider this book, too (we also made these sweet potatoes out of the book). Seriously, if nothing else, the pictures are to die for. This particular recipe jumped out at us right away…because it was on the cover! It just looked SO good!! And it was; we were not disappointed at all! We served this as a side to grilled lamb chops and garlic bread that I rubbed with garlic and dusted with Za’atar before toasting. Preheat the oven to 400º. Cut the eggplants in half lengthwise. Use a small, sharp knife to make three or four parallel incisions in the cut side of each eggplant half, without cutting through to the skin. Repeat at a 45 degree angle to get a diamond-shaped pattern. Place the eggplant halves, cut side up, on a baking sheet line with parchment paper. rush them with olive oil – keep on brushing until all of the oil has been absorbed by the flesh. Sprinkle with the lemon thyme leaves and some salt and pepper. Roast for 35 to 40 minutes, at which point the flesh should be soft, flavorful, and nicely browned. Remove from the oven and allow to cool down completely. To make the sauce, whisk together all of the ingredients. Taste for seasoning, then keep cold until needed. To serve, spoon plenty of buttermilk sauce over the eggplant halves. 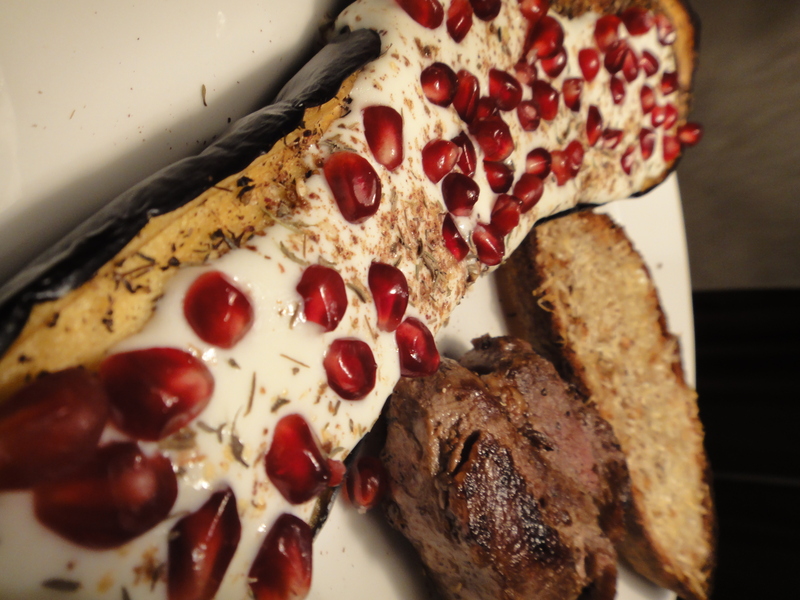 Sprinkle with za’atar and plenty of pomegranate seeds on top garnish with lemon thyme. Finish with a drizzle of olive oil. Every time I see this, I want to make it. Thanks for the reminder. That looks so pretty – I love the addition of pomegranate.